The Flash é uma série de super-herói criada por Greg Berlanti, Andrew Kreisberg e Geoff Johns para o canal CW. A série é baseada nos quadrinhos de mesmo nome da DC Comics e traz a história do Barry Allen, um investigador da polícia que é atingido por um raio e consegue correr em “super-velocidade”. A partir daí ele irá usar seu poder para capturar criminosos, incluindo outros meta-humanos. Assistiu a série e gostou da trilha sonora? Então confira abaixo todas as músicas de The Flash com as cenas em que elas tocaram, separadas por episódio. Episódio 19 – Who Is Harrison Wells? Essa página demora um pouco para ser atualizada, se não encontrar o episódio que procura verifique por aqui. 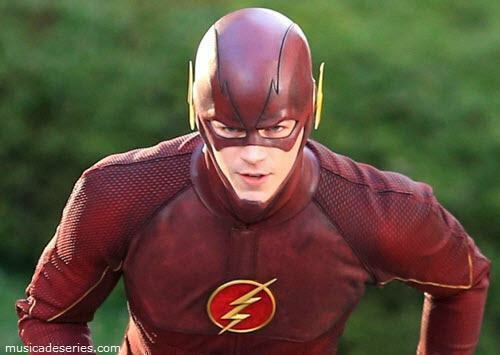 Pingback: Músicas The Flash Temporada 2 Ep 18 "Versus Zoom"
Pingback: Músicas The Flash Temporada 2 Ep 19 "Back to Normal"
Pingback: Músicas The Flash Temporada 2 Ep 20 "Rupture"
Pingback: Músicas The Flash Temporada 2 Ep 21 "The Runaway Dinosaur"
Pingback: Músicas The Flash Temporada 2 Ep 22 "Invincible"
Pingback: Músicas The Flash Temporada 2 Ep 23 "The Race of His Life"
Pingback: Músicas The Flash Temporada 3 Ep 16 "Into the Speed Force"
Pingback: Músicas The Flash Temporada 3 Ep 23 "Finish Line"
Pingback: Músicas The Flash Temporada 4 Ep 1 "The Flash Reborn"
Pingback: Músicas The Flash Temporada 4 Ep 2 "Mixed Signals"
Pingback: Músicas The Flash Temporada 4 Ep 3 "Luck Be a Lady"
Pingback: Músicas The Flash Temporada 4 Ep 4 "Elongated Journey Into Night"
Pingback: Músicas The Flash Temporada 4 Ep 5 "Girls Night Out"
Pingback: Músicas The Flash Temporada 4 Ep 6 "When Harry Met Harry…"
Pingback: Músicas The Flash Temporada 4 Ep 7 "Therefore I Am"
Pingback: Músicas The Flash Temporada 4 Ep 8 "Crisis on Earth-X, Part 3"
Pingback: Músicas The Flash Temporada 4 Ep 10 "The Trial of The Flash"
Pingback: Músicas The Flash Temporada 4 Ep 11 "The Elongated Knight Rises"
Pingback: Músicas The Flash Temporada 4 Ep 12 "Honey, I Shrunk Team Flash"
Pingback: Músicas The Flash Temporada 4 Ep 13 "True Colors"
Pingback: Músicas The Flash Temporada 4 Ep 14 "Subject 9"
Pingback: Músicas The Flash Temporada 4 Ep 15 "Enter Flashtime"
Pingback: Músicas The Flash Temporada 4 Ep 16 "Run, Iris, Run"
Pingback: Músicas The Flash Temporada 4 Ep 17 "Null and Annoyed"
Pingback: Músicas The Flash Temporada 4 Ep 18 "Lose Yourself"
Pingback: Músicas The Flash Temporada 4 Ep 19 "Fury Rogue"
Pingback: Músicas The Flash Temporada 4 Ep 20 "Therefore She Is"
Pingback: Músicas The Flash Temporada 4 Ep 21 "Harry and the Harrisons"
Pingback: Músicas The Flash Temporada 4 Ep 22 "Think Fast"
Pingback: Músicas The Flash Temporada 4 Ep 23 "We Are The Flash"
Pingback: Músicas The Flash Temporada 2 Ep 2 "Flash of Two Worlds"
Pingback: Músicas The Flash Temporada 5 Ep 3 "The Death of Vibe"
Pingback: Músicas The Flash Temporada 5 Ep 6 "The Icicle Cometh"
Pingback: Músicas The Flash Temporada 5 Ep 7 "O Come, All Ye Thankful"
Pingback: Músicas The Flash Temporada 5 Ep 8 "What's Past is Prologue"
Pingback: Músicas The Flash Temporada 5 Ep 9 "Elseworlds, Part 1"
Pingback: Músicas The Flash Temporada 5 Ep 10 "The Flash & The Furious"
Pingback: Músicas The Flash Temporada 5 Ep 14 "Cause and XS"
Pingback: Músicas The Flash Temporada 5 Ep 15 "King Shark vs. Gorilla Grodd"
Pingback: Músicas The Flash Temporada 5 Ep 16 "Failure is an Orphan"